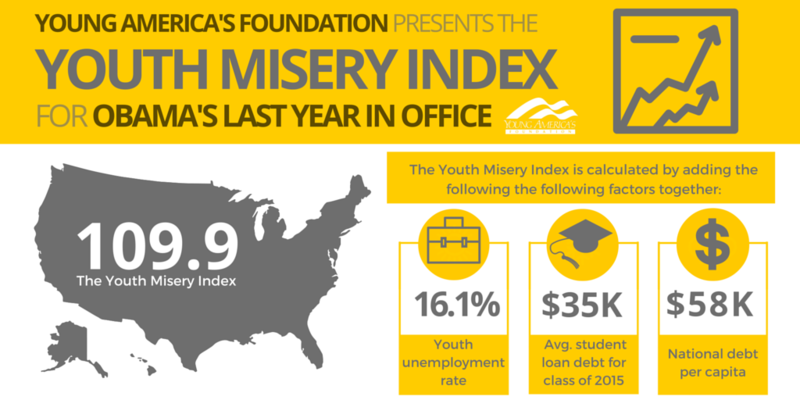 The Youth Misery Index (YMI), a figure calculated annually by Young America’s Foundation, spiked to a record high of 109.9 this year, up from 106.5 last January, and 83.5 in 2009 when President Obama took office. The Index is calculated by adding youth unemployment, student loan debt, and national debt (per capita) numbers. On Wednesday, January 20, 2016 President Obama will enter his final year in office with the Youth Misery Index up 32 percent since 2009. Young Americans have slogged through the Obama Presidency and will be chained to its impact on their generation for years to come. The youth unemployment rate exceeds 16 percent and the average student in the class of 2015 graduated with a record $35,000 in student loan debt. National debt per capita, a remarkable burden that will fall squarely on the shoulders of millennials, is just under $59,000. Young Americans—many of whom helped elect President Obama—are utterly disappointed by the impact his policies have had on their lives. They are struggling to find employment, drowning in tens of thousands of dollars of personal debt, and faced with the prospect of paying off an $18 trillion national debt. His Presidency has been a boon for youth misery and a disaster for millennials. A recent Young America’s Foundation poll found the top three issues college students care about most are (1) education, (2) student loan debt, and (3) jobs. Despite having two terms to do so, President Obama has unequivocally failed to address Young Americans’ highest priorities. In fact, the same poll found college students’ are growing more supportive of limited government and the free market. For instance, 35% of students said they prefer free markets to government regulations while only 16% prefer government regulations. Furthermore, more students believed a “strong free market” (48%) does a better job handling today’s complex economic problems than a “strong/active government” (39%). “President Obama’s tenure has been disastrous for young Americans. They’re ready for change, and conservative ideas offer substantive solutions to the serious challenges they face,” said Ron Robinson, president of Young America’s Foundation. This Wednesday, January 20, marks the first day of President Obama’s last year in office. The boundless climb of this record-shattering Youth Misery Index will no doubt impact who assumes the nation’s highest office one year from today. For more information, or to cover this story, contact Emily Jashinsky at ejashinsky@yaf.org.